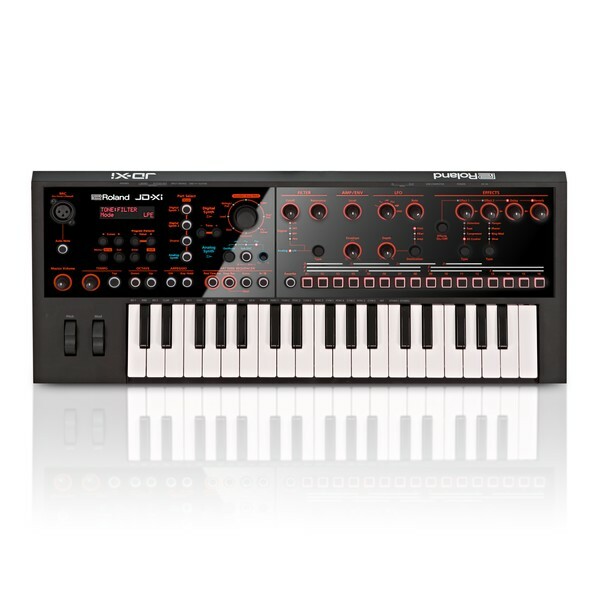 The Roland JD-Xi Synth is the ultimate analog/digital synthesizer which combines the best of the analog and digital worlds to create a versatile and comprehensive synth. 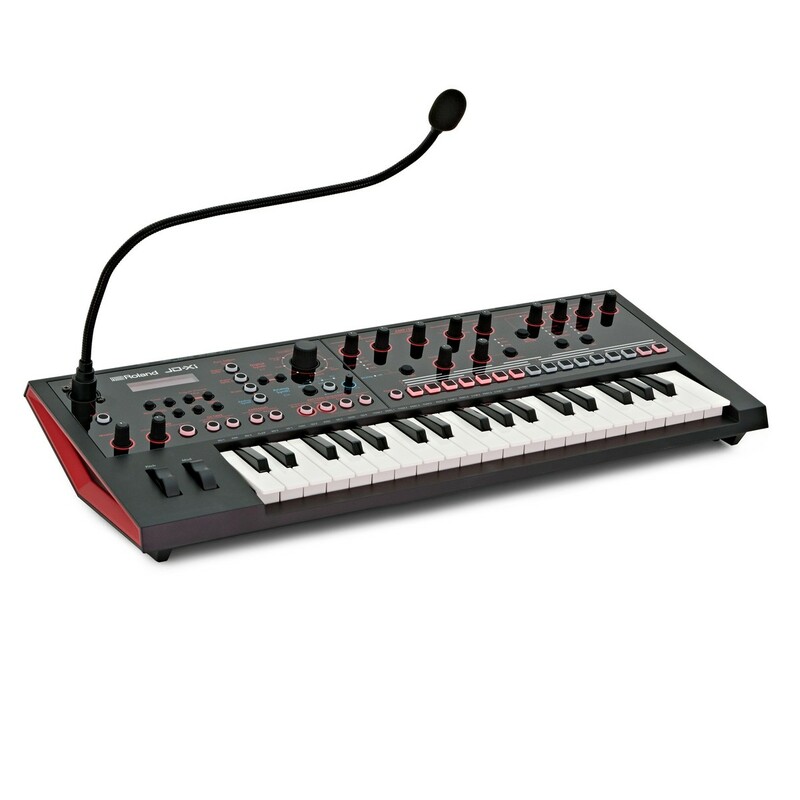 Featuring 37 velocity sensitive mini keys, four track pattern sequencer, legendary supernatural synth tones, 128 voice polyphony and gooseneck microphone for impressive vocal effects the JD-Xi Synth is the only synth you will need to create impressive and expressive tracks whether performing live or in the studio. Incorporating an innovative and powerful analog/digital crossover sound engine the JD-Xi combines the best features of both to deliver an extremely versatile and expressive synth in one stylish and robust unit. 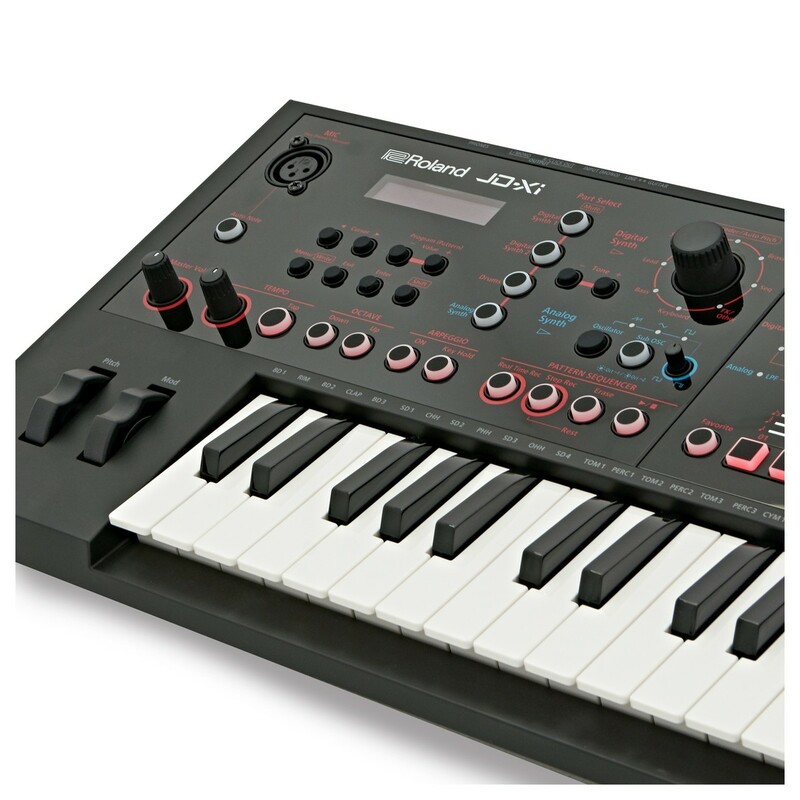 Producing the warm and authentic tone of a traditional analog synth combined with the clarity and adaptability of a modern digital synth the JD-Xi is perfect for a range of music genres and playing styles. Featuring saw, triangle and square waveforms with pulse modulation and analog filtering the JD-Xi offers a huge variety of tones and also includes a independent sub oscillator for optimized low response. Two digital synth sections offer 128-voice polyphony and a wide range of high-quality SuperNATURAL synth tones, including pads, strings, electric piano, sound effects, and many others. 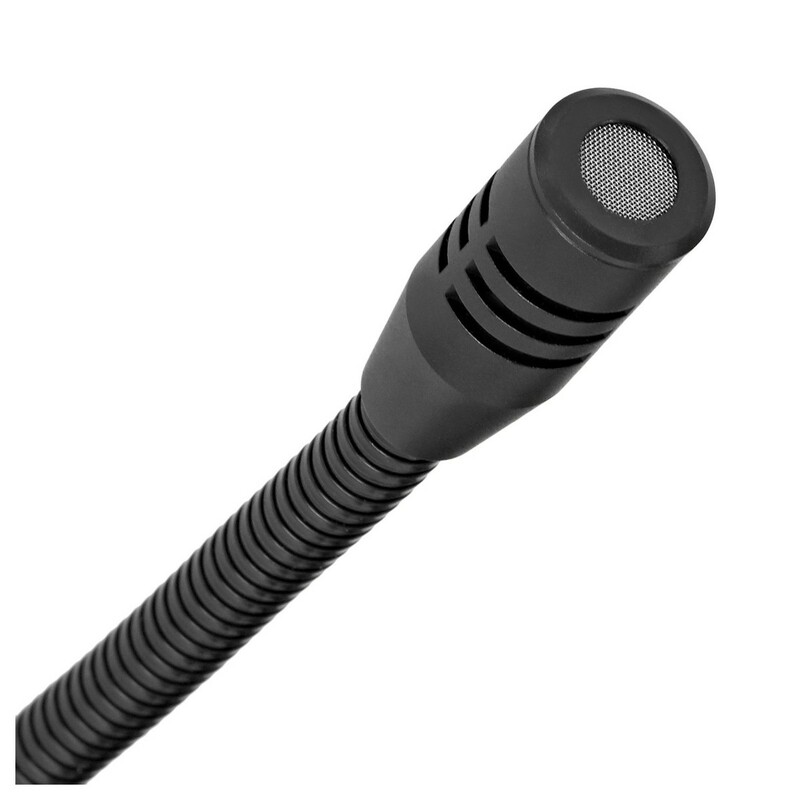 With a built in gooseneck microphone you can produce a variety of vocoder, autopitch and other vocal effects to add a unique flavour to your performance. 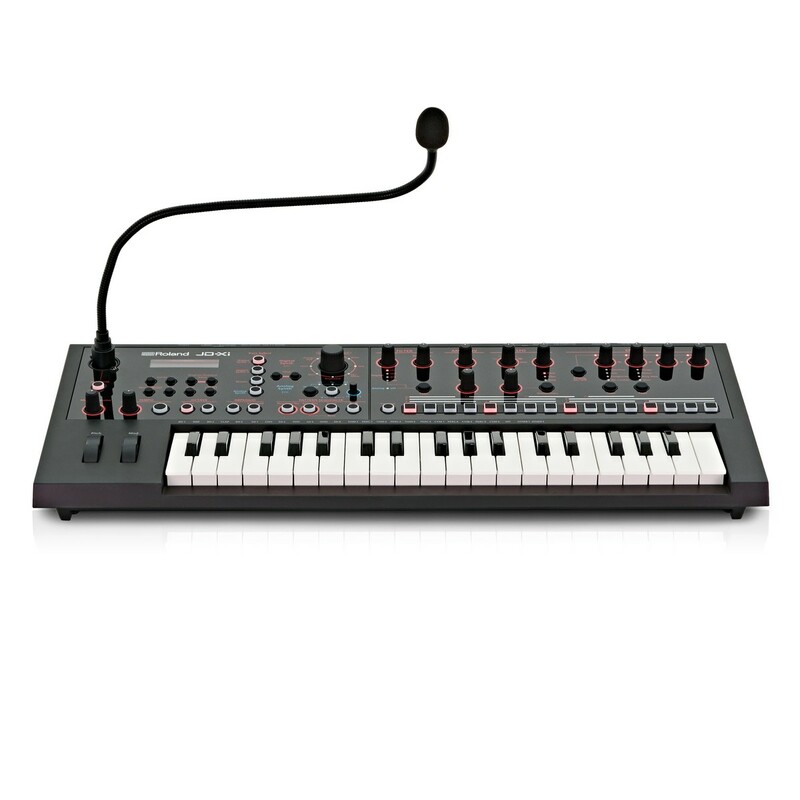 Simply sing into the gooseneck microphone and use the keyboard to control the pitch and sounds created whilst the auto note function allows you to "sing" synth sounds without even interacting with the keyboard. 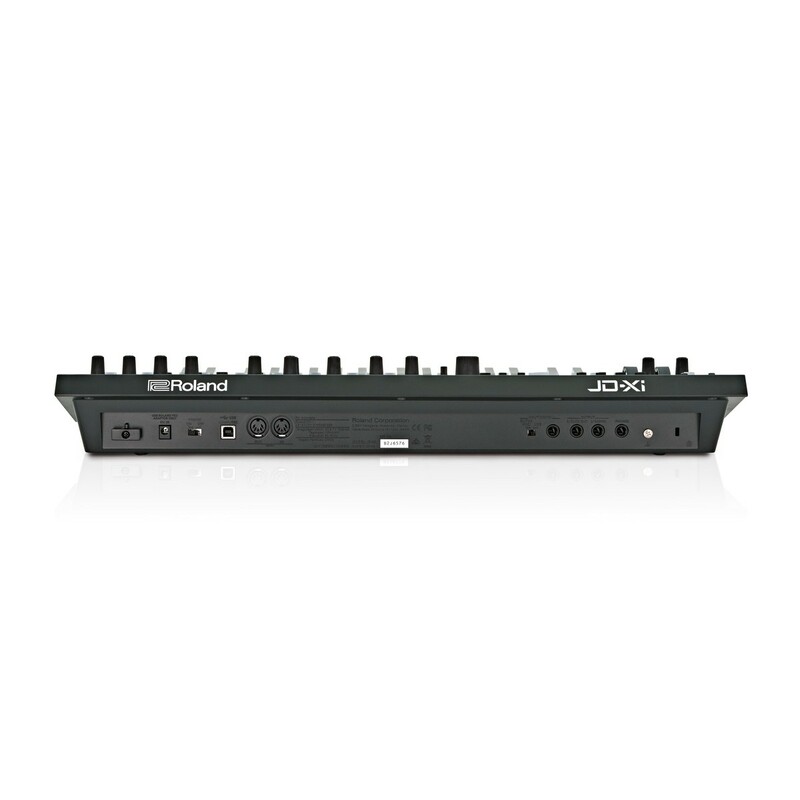 The built in pattern sequencer the JD-Xi offers four separate tracks of two digital synths, analog synths or drum patterns allowing full and intricate loop creation. 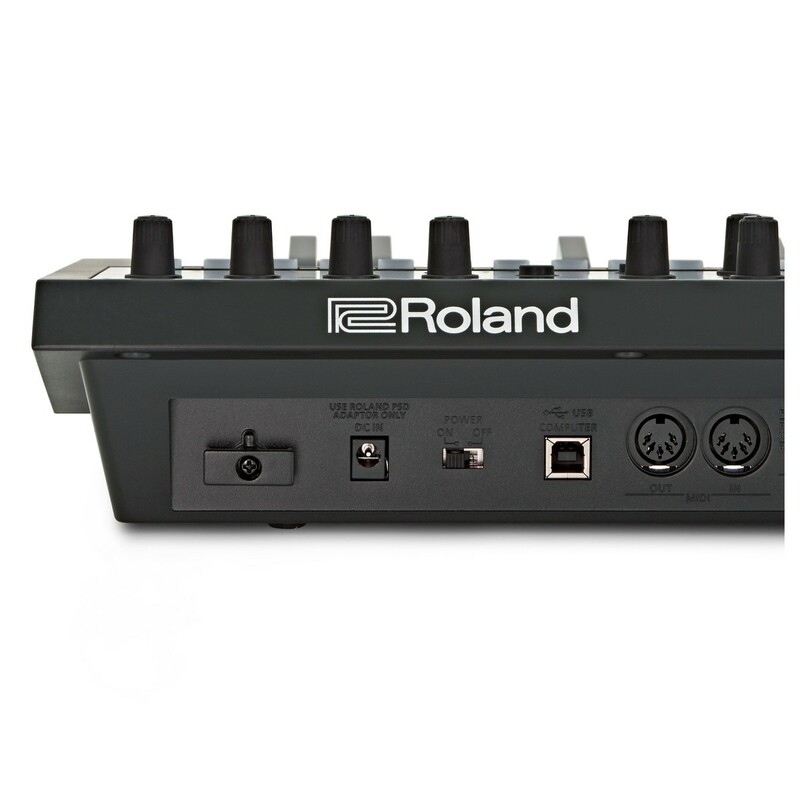 Additionally the real-time and step recording modes provide unique programming whilst the TR-REC mode offers the traditional Roland TR-Series beatboxes. It's easy to play patterns and tweak sounds as you perform, and many preset patterns are built in for jamming right out of the box. Loaded with a huge variety of professional captured and edited drum samples the JD-Xi can create premium quality rhythm patterns with full and realistic sounding drums. With both electronic and acoustic drum kits the JD-Xi has kits to suit everyone which are clearly labelled and selectable through the built in screen. Furthermore you can also customize and edit each drum kit to create hybrid kits by adjusting the filter, envelope, pitch and pan parameters on each individual drum sound. 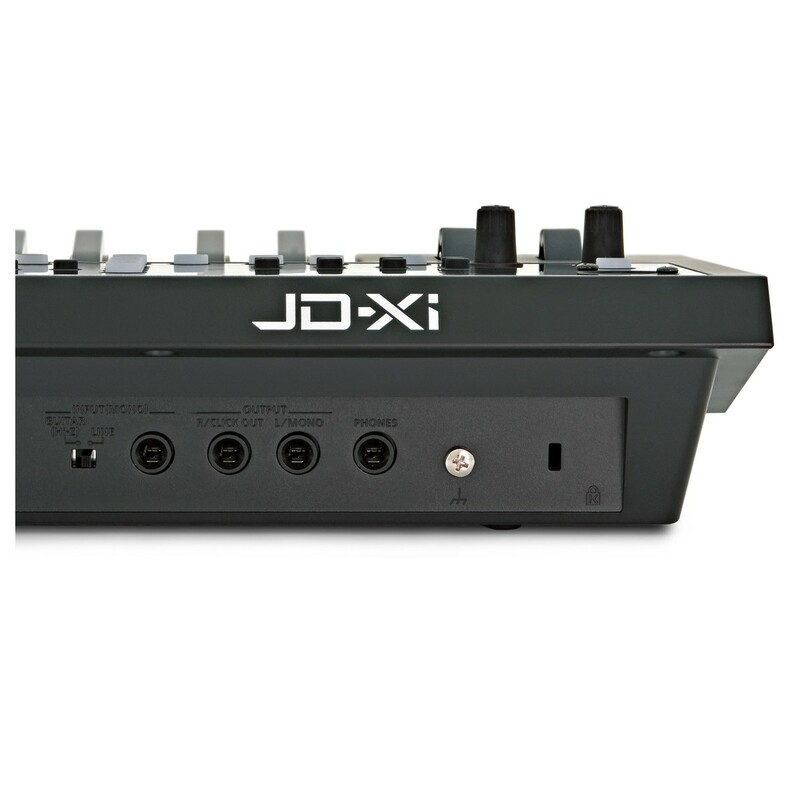 The JD-Xi incorporates four powerful and individual effects sections which allow you add a range of effects to your sounds to create unique and professional tones. With effect 1 and 2 offering effects such as Bit Crusher, Slicer and Ring Mod the JD-Xi also features independent Delay and Reverb controls to create spacious ambient tones. Each effects section can be turned on/off separately for the three synth sections and drums, allowing you to shape your mix with many creative combinations. 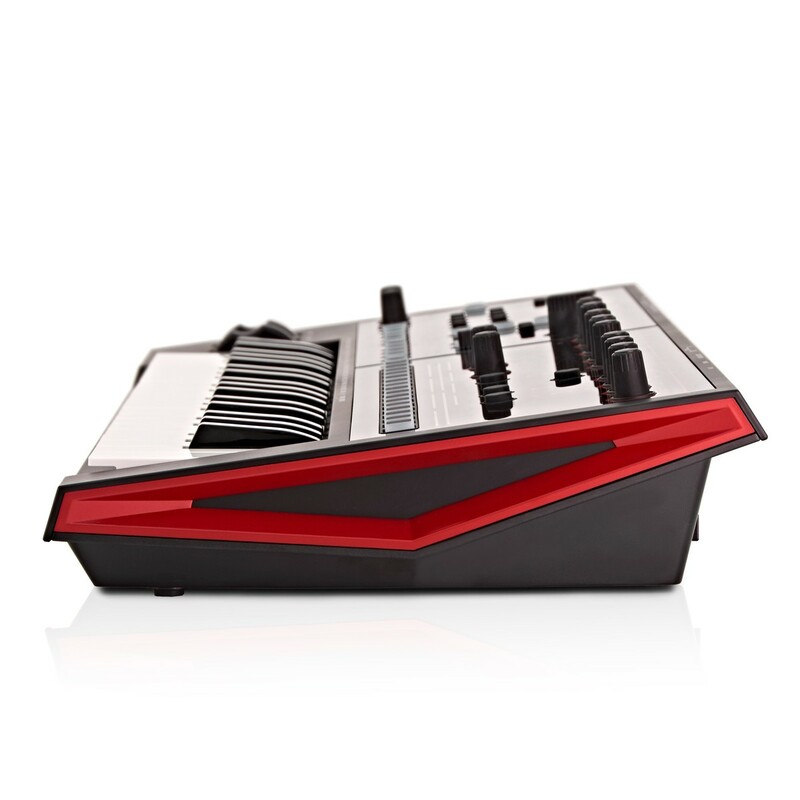 To mark the launch of the JD-Xi synth in limited-edition red or white, Roland is proud to introduce two new JD-Xi sound collections; the Red Collection and the White Collection. The Red Collection is more energetic and aggressive, developed for tempos above 120bpm, while the White Collection is for more relaxed productions under 120bpm. Both collections contain eight new programs suitable for a variety of electronic music styles, each one making the most of the JD-Xi's 4-part analog/digital crossover sound engine and powerful DSP section for a truly inspiring musical experience. 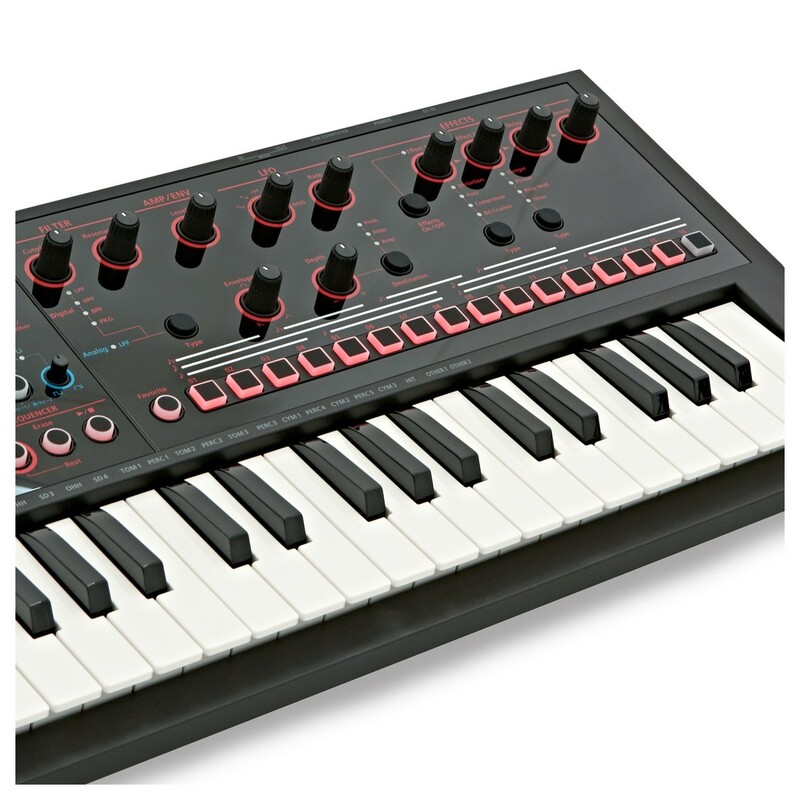 Free Expansion Sounds: To receive your free JD-Xi Red and White Collection sounds simply download from the Roland Axial website. USB COMPUTER Port (USB Hi-Speed AUDIO/MIDI) - Use a USB cable and a computer with a USB port that support Hi-Speed USB.